NOTE: This list is for informational and educational purposes only. It is not intended to provide medical or financial advice. AAMDSIF does not recommend or endorse any of these programs. It is your responsibility to check with each organization to learn which resources are currently available. FINANCIAL ASSISTANCE AND SUPPORT – GENERAL. PHARMACEUTICAL COMPANY PATIENT ASSISTANCE (drug specific). The American Cancer Society has numerous support programs for patients and families including 30 Hope Lodges located throughout the U.S. that offer a free place to stay during treatment and the Road to Recovery Program which connects patients to volunteers who provides free rides to medical appointments. The Assistance Fund (TAF) has launched of a new financial assistance program for individuals living with Paroxysmal Nocturnal Hemoglobinuria (PNH). The fund helps qualifying PNH patients by providing financial assistance for their copayments, coinsurance, deductibles and other health-related expenses. To learn more or determine eligibility for financial support, PNH patients should visit www.tafcares.org or call (855) 308-0212 to speak with a TAF patient advocate. Patient aid program that provides coverage for many costs associated with bone marrow transplant. Grants are limited to specific institutions, so speak to a hospital social worker or call BMF for more information. The BMT InfoNet Patient Assistant Fund (PAF) assists patients and caregivers with living expenses during treatment. Provides fundraising assistance for children & young adults needing bone marrow transplants. Also advocates for marrow, organ and tissue donation. Nonprofit foundation established by Cerner Corporation. Assists families of children with health problems address financial aspects of their child's health care. Provides small grants, information and support for fundraising and patient awareness. Provides qualified MDS patients who live in Illinois with financial assistance. The program reimburses almost any treatment-related expense not covered by medical insurance. Nonprofit organizations dedicated to creating an opportunity for all patients to receive bone marrow or umbilical cord blood transplant when needed. Offers personal assistance to patients with MDS. Through a personal case manager, they may be able to help you deal with your insurance company, as well as health-related problems with your employer or creditors. Largest of several Federal programs that provide assistance to people with disabilities. You can also speak with your hospital's social worker for additional information. CancerCare® Co-Payment Assistance Foundation (CCAF) is a nonprofit organization dedicated to helping patients afford their co-payments for chemotherapy and targeted treatment drugs. Offers co-pay assistance for Myelodysplastic Syndromes (MDS), Acute Myeloid Leaukemia (AML), Acute Lymphoblastic Leukemia (ALL), Myeloproliferative Neoplasms (MPN) – Essential Thrombocythemia, Myelofibrosis, and Polycythemia Vera. Offers co-pay assistance for pediatric MDS and AML as well. Offers financial and emotional support for Michigan residents with blood and bone marrow disorders. Provides medication co-pay assistance for MDS patients with private insurance or Medicare Part-D plan. If CDF cannot help you, they will refer you to other resources for assistance. The HealthWell Foundation provides financial assistance to eligible individuals to cover coinsurance, copayments, health care premiums and deductibles for certain medications and therapies. They have a pediatric assistance fund regardless of disease and an Acute Myeloid Leukemia (AML) fund. Offers two programs to help pay for covered services. APatient Financial Aid program offers up to $150 per year to patients for approved drugs, blood and marrow transfusions, transportation costs to appointments and x-ray therapy. The Co-Pay Assistance Program can provide up to $5,000 to help patients with insurance, out-of-pocket costs associated with treatment for MDS or another eligible disease. The Julia’s Wings Foundation (JWF) is a 501(c)(3) non-profit organization with the mission of providing assistance to families of children with the life threatening hematological diseases; aplastic anemia, MDS and PNH. Provides detailed information on Medicaid, including information on enrollment, new initiatives and prescription drugs. Also includes information on reimbursement and financial assistance. Provides information on public and private programs that offer discounted or free medication, programs that provide help with other health care costs and Medicare health plans that include prescription coverage. Your county may be able to provide you with a discount card that allows you to buy medications at a reduced rate at participating pharmacies. Advance Rx's website provides a list of counties that offer the card, instructions on requesting a card and resources to find pharmacies where it can be used. Nonprofit organization that helps people who cannot afford medicine or healthcare costs. Information is available anonymously and free. NORD works with pharmaceutical companies to ensure that vital medications are available to those in need. They currently offer a program to assist with premiums and co-pays for PNH patients. Provides up to $12,000 per year to MDS patients who have insurance but cannot afford out-of-pocket costs. Check eligibility requirements. Applications are on their website or you can call a counselor. Single point of access to more than 275 public and private patient assistance programs, including more than 150 offered by pharmaceutical companies. Maintains a database of resources for low-income patients to receive free or low-cost medications. National nonprofit organization. Provides a free card for discounts on more than 300 brand-name drugs and some generic drugs at participating pharmacies. There are income and other requirements, and you must be a legal resident of the U.S. Links patients with numerous free flight programs. Offers free flights in the U.S. Volunteer pilots are available to fly patients in need to specialized health care facilities. Provides a free flight for the patient and a support person for distances under 1,000 miles. Provides families with a place to stay at every major military and VA medical center. Cost per family ranges from free to $10 per night. Speak with the hospital's social worker for additional options. Referral service that connects patients to free flights. Uses donated frequent-flyer miles to provide flights for children who require medical treatment that is not available where they live. Oxygen is available on flights. Flies children who are struggling with serious cancers and debilitating diseases to specialized medical treatment centers across the U.S. Referral service for 150 nonprofit organizations that provide comfortable lodging for families supporting their loved ones during medical treatment. Cost for accommodations starts at $15 per night per family. Provides information about charities that assist with long-distance medical air transport. Provides families with housing while their children receive medical treatment. Families are asked to make a $5 - $20 donation per night, if possible. Assists patients who have been prescribed Solaris (eculizumab) by connecting them to alternate funding sources and by getting their insurance company to process claims. They also offer several other services. Amgen makes the drugs Aranesp, Neulasta, Neupogen, Nplate and Epogen. The program offers patient assistance with a variety of programs. The website also includes guides to insurance verification, patient assistance and billing and claims support. Provides information about their products, including Revlimid and Vidaza. Patients can ask questions about insurance reimbursement and underinsured patients may be able to receive free medication. Provides access to Exjade through a special distribution system. Other financial/claims assistance may be available. Makers of the drugs Procrit and Leustatin offers a patient assistance program and benefit verification program. Additional services available by phone. Forms for patient assistance and benefit verification are available for download. Offers services such as benefit verification, claims review and billing assistance. It can also offer access to treatment for uninsured patients who meet program criteria. Includes listings of health insurance assistance programs by state. These programs handle many questions about Medicare, Medicaid and private insurance and may be able to refer you to low-cost or free health care (which may include prescription drug assistance). Exists to simplify health insurance eligibility information and help more people get coverage. Site includes eligibility information and links to applications for health coverage programs. Publishes consumer guides for getting and keeping health insurance for every state. Also includes summaries of the guides and glossaries of terms. Government-run program provides uninsured children with health insurance. In most states, uninsured children under the age of 18 whose families earn up to $44,500 per year are eligible for free or low cost insurance. Programs vary by state. Offers help to patients with chronic myelogenous leukemia. If you have access to insurance through COBRA, a state-run High Risk Pool, or a private insurance policy, PSI may be able to help you pay your premiums. They also offer assistance covering out-of-pocket costs for medication, medical devices, transportation to treatment and other expenses not covered by insurance. The Aplastic Anemia and MDS International Foundation help ensure that all PNH patients can see a PNH specialist for the best course of treatment. With demonstrated financial need, it may be able to provide financial aid up to $3,000 per eligible, U.S.-based PNH patient . Patient aid program provides coverage for many costs associated with bone marrow transplant. Grants are limited to specific institutions, so speak to a hospital social worker or call BMF for more information. Established scholarship fund for high school students offers twelve one-year scholarships of $1,500 each. Provides scholarships to full-time students from disadvantaged backgrounds enrolled in health professions and nursing programs. Contact student financial aid office at the school where you are, or intend to be, enrolled. Developed to help make postsecondary education possible for all students. Offered by the U.S. Department of Education to ensure that all eligible individuals benefit from federal financial assistance - grants, loans and work-study programs for education beyond high school. Provides support to patients seeking to initiate or complete a course of study that has been interrupted or delayed by a diagnosis of cancer or other life­ threatening disease. Provides free camp and travel to Camp Simcha. Preference is given to children with hematological disorders. Provides toys for seriously or terminally ill children worldwide. Makes dreams come true for seriously ill children - from meeting a celebrity to trips to Disney World. Provides enrichment programs to terminally ill children and their families. Grants dreams to children diagnosed with critical or chronic illnesses who are 3 through 18 years of age. Makes wishes come true for terminally ill children. Provides free camp stay at Hole in the Wall Camps. Paul Newman founded this nonprofit year-round camping association in 1988. The Peer Support Network consists of a national network of volunteers, including patients, caregivers and family members willing to listen and offer comfort and support. The Peer Support Connection can put you in touch with other parents who are dealing with issues similar to your own. In addition, volunteers may share personal experiences, coping strategies, problem solving skills, and informational resources. Peer support sessions take place over the phone. Caring Bridge provides an online space where you can connect, share and receive support – a personalized "caring" social network, available 24/7 to everyone at no cost. Protected sites make it easy to post health updates during any type of health event. Family and friends visit the site to stay informed and leave supportive messages. CarePages is an online community where visitors come together to share the challenges, hopes and triumphs of people facing a life-changing health event. Their mission is to ensure that no one faces a health challenge alone. Through personalized websites, members can relate their stories, post photos and update friends and family instantly. In turn, people who care can send messages of love and encouragement. CarePages also offers a variety of resources and support tools for living a more compassionate life. Lotsa Helping Hands connects people through the power of community — whether you need help or you want to provide help. You may be caring for a loved one who's sick, an aging parent, a child with special needs or a veteran. When people rally to help someone in their family or community, Lotsa Helping Hands makes it easier for each person to know what to do and when. Marrowforums is an online discussion group for patients, family, caregivers and friends dealing with bone marrow failure diseases. Extended family and professionals who work with these diseases are also welcome. MPN Advocacy & Education International provides resources, quality education programs, advocacy support and services to patients with myelofibrosis, essential thrombocythemia and polycythemia vera, caregivers, physicians and all those in the MPN community. It is committed to assisting, directing and informing its constituents on pertinent issues that impact quality care, treatment accessibility, updates on current research and updates on clinical trials. Learn more about patient conference for those dealign with MPNs at www.mpnadvocacy.com/events/. The National Heart, Lung and Blood Institute provides global leadership for research, training, and education programs to promote the prevention and treatment of heart, lung and blood diseases. The site provides reliable information on bone marrow failure diseases and their treatment. The National Institutes of Health (NIH) is the nation's leading medical research agency. Its work leads to important medical discoveries that improve people's health and saves lives. NIH scientists investigate ways to prevent disease, as well as discover the causes, treatments and even cures for common and rare diseases. You can search on this site for aplastic anemia, MDS or PNH and review current research. This is the world's largest medical library. Their website provides comprehensive information on various bone marrow failure diseases. Patient Empowerment Network’s mission is to fortify cancer patients and care partners with the knowledge and tools to boost their confidence, put them in control of their healthcare journey, and assist them in receiving the best, most personalized care available. Compassionate Allowances (CAL) are a way of quickly identifying diseases and other medical conditions that invariably qualify under the Listing of Impairments based on minimal objective medical information. In 2012, Aplastic Anemia was added to this list. Compassionate Allowances lets Social Security target the most obviously disabled individuals for allowances based on objective medical information. Compassionate Allowances is not a separate program from the Social Security Disability Insurance or Supplemental Security Income programs. Matches volunteer patients who meet necessary criteria with appropriate research studies. Caregiver Resources in the Ask Medicare Toolkit are designed to help caregivers address challenging issues and work effectively with Medicare to ensure their family members and friends receive the best possible care. Aging in Place connects seniors, families, and caretakers with the information and professional support they need to make the best decision for their physical, emotional, and financial well being. Our resources and network of experts help ensure your home evolves to best accommodate your changing budget, mobility, and health. This site provides general information on promoting health and well-being for children. You can also search for articles on specific bone marrow failure diseases. With the help of Dr. David Margolis, Program Director of Children’s Hospital of Wisconsin’s Blood and Bone Marrow Transplant Program, AAMDSIF presents an explanation of bone marrow failure, the treatments, side effects and activity restrictions in The Bone Marrow Garden, a video and slide presentation created especially for children and adolescents. This site is sponsored by the National Women's Health Information Center of the U.S. Department of Health and Human Services. It is written by and for young women in their teens. A section under "Illness and Disability" addresses many questions and concerns expressed in this age group about hospital life, school, friends, family and dating. Listen to Dr. Dave Margolis, Director of the Children’s Hospital of Wisconsin pediatric bone marrow transplant program help kids understand bone marrow failure syndromes in the video. This webinar is developed to help young adults with bone marrow failure and their families be better prepared for adulthood, especially the move from pediatric to adult-oriented health care. Dr. Michael Pulsipher and patient Catherine MacLean discuss key issues for patients in this age group and share strategies for how to make the successful transition from pediatric to adult care. Watch Dr. Inga Hoffman, MD, PhD, of Boston Children’s Hospital discuss issues regarding MDS in Children. The North American Pediatric Aplastic Anemia Consortium (NAPAAC) is a collaborative research effort that seeks to develop better therapies for children with aplastic anemia by combining the expertise and resources of the leading pediatric hematologists in North America. Partnership for Parents is a safety net for parents of children with serious illnesses. The Pediatric MDS and BMF Registry is an NIH-supported collaborative research effort that includes centers across the country, including the Children’s Hospital in Boston. This check-list identifies key tasks that young adults should be able to do as they make the transition out of pediatric healthcare and how families should prepare for it. Is your family ready to support this transition? Checklists are in English and Spanish. This check-list identifies key tasks that young adults should be able to do as they make the transition out of pediatric healthcare. Is your child ready to transition? Checklists are in English and Spanish. The Department of Veterans Affairs (VA) offers a number of resources for caregivers and veterans, including VA's Caregiver Support Line: (855)-260-3274. In addition, the VA has created a Caregiver Tool Box to help you find tools that work for your veteran. This site is dedicated exclusively to serving the needs of patients facing a bone marrow, blood stem cell or umbilical cord blood transplant. In addition to high-quality medical information in easy-to-understand language, BMT InfoNet offers patients and survivors emotional support. A volunteer network of over 200 transplant survivors is available to help newly diagnosed patients and their loved ones cope with the stress of a life-threatening diagnosis, and the prospect of a bone marrow, stem cell or cord blood transplant. BMTSupport.org is an interactive non-profit organization designed to motivate, empower and enlighten people with an interest in bone marrow transplantation through peer support, education and awareness of this difficult but potentially lifesaving procedure. Their mission is to support those who suffer the effects of illness before, during and after transplant, to celebrate the miracles that bone marrow transplantation has given to those who are now well, and to offer encouragement those facing marrow transplantation. The mission of The Bone Marrow Foundation is to improve the quality of life for bone marrow and stem cell transplant patients and their families by providing financial aid, education and emotional support. nbmtLink is a non-profit organization specifically serving stem cell transplant patients, their caregivers and families, as well as health professionals. The mission of nbmtLink is to help the patient community and the health care community meet the many challenges of stem cell transplant by providing vital information and support services. The National Marrow Donor Program helps people who need a life-saving marrow or blood cell transplant. They connect patients, doctors, donors and researchers to the resources they need to help more people live longer, healthier lives. To achieve this mission, they search the "Be The Match" National Bone Marrow Registry - the largest database of volunteer donors and cord blood units in the world. They support patients and their doctors throughout the transplant process and match patients with the best donor or cord blood unit using innovative science and technology. A 20-minute animated film from the National Bone Marrow Donor Program (“Be the Match”) features Sam, a young boy making an epic movie production about his own transplant experience. Along the way, Super Sam meets many everyday heroes (patients, siblings, and health care staff) who talk about the hospital, their feelings, what a transplant means and what recovery is like. Companion activity sheets and a word puzzle for kids to complete after seeing the Super Sam film. AgingCare.com is a community of caregivers facing the challenge of caring for an elderly loved one. They offer tips about how to cope when you know your elderly parent is dying soon. Aging with Dignity is a national non-profit organization with a mission to affirm and safeguard the human dignity of individuals as they age and to promote better care for those near the end of life. Their Five Wishes meets the legal requirements in 42 states and has helped literally millions of people plan for and receive the kind of care they want. Five Wishes is unique among all other advance directives and living wills because it is user-friendly and easy to complete. Five Wishes is available in 27 languages and in Braille to address the needs of an ethnically and culturally diverse nation. Like the English version, translated versions of Five Wishes are written in easy-to-understand language. Each foreign language copy of Five Wishes carries a side-by-side English translation for medical providers and others who speak only English. Caring Connections was created by the National Hospice and Palliative Care Organization to provide free, easy-to-understand resources on a variety of issues. Children's Hospice International provides care for children from the time of their diagnosis with a life-threatening condition with hope for a cure, through bereavement if a cure is not attained. Dying Well—The Final Stage of Survivorship is the National Coalition for Cancer Survivorship’s toolkit. Dying Well is an informative, supportive, and reassuring program designed to teach you more about your choices and resources and what to expect during this last stage of survival. End-of-Life: Helping with Comfort and Care hopes to make the unfamiliar territory of death slightly more comfortable for everyone involved. This publication is based on research, such as that supported by the National Institute on Aging, part of the National Institutes of Health. This research base is augmented with suggestions from practitioners with expertise in helping individuals and families through this difficult time. End-of-Life Issues and Care from the American Psychological Association highlights the role of psychologists in helping the dying and their loved ones. They can assess mood, mental functioning and pain; treat depression, anxiety and other mental health problems; provide end-of-life counseling to the dying and their families; and advocate for good medical care. End-of-Life Issues from the American College of Physicians provides a set of tools that can help patients and families live well with serious illness near the end of life. These educational materials can be used to facilitate conversations between physicians, patients, and their families. Hospice Foundation of America is a trusted source of information on end of life, hospice care and grief. Throughout this site you will find information about living with advanced life-limiting illness, options for care, and helpful resources for caregivers. Promoting universal access to high-quality palliative care, integrated in a continuum of care with disease prevention and treatment, to assure that no patient or family caregiver suffers unnecessarily. Last Days of Life provides information about managing symptoms, ethical issues in end-of-life decisions, and grief and loss. As part of the National Cancer Institute's (NCI's) comprehensive cancer information database this Physician Data Query (PDQ®) is written in easy-to-understand, nontechnical language. Last Days of Life is also available in Spanish. National Hospice and Palliative Care Organization is a nonprofit that provides information on hospice care for professionals, caregivers, and families. Considered to be the model for quality, compassionate care for people facing a life-limiting illness or injury, hospice care involves a team-oriented approach to expert medical care, pain management, and emotional and spiritual support expressly tailored to the patient's needs and wishes. Support is provided to the patient's loved ones as well. This non-profit, Internet resource provides information and support to patients and families facing a life-threatening illness. The Veterans Administration has joined forces with hospice organizations to better serve and meet the needs of its terminally ill veterans. Pediatric My Wishes is a booklet written in everyday language that helps children express how they want to be cared for in case they become seriously ill. Like Five Wishes, My Wishes also helps begin conversations among children, parents, and caregivers. My Wishes is not a legal document. Individual copies of Pediatric My Wishes can be purchased for $5.00 from the Aging with Dignity organization. Spirituality in Cancer Care is another PDQ® from the National Cancer Institute's (NCI's) comprehensive cancer information database. Many patients with cancer rely on spiritual or religious beliefs and practices to help them cope with their disease. This is called spiritual coping. Many caregivers also rely on spiritual coping. Each person may have different spiritual needs, depending on cultural and religious traditions. Voicing My Choices: A Planning Guide for Adolescents and Young Adults (and Spanish language Expresar Mis Deseos) helps young people living with a serious illness to communicate their preferences to friends, family, and caregivers. Voicing My Choices, based on findings in the journal, Pediatrics, recognizes the standard advanced care planning documents don’t meet all the needs of younger patients. This study found that adolescents and young adults living with a life-threatening illness want to be able to choose and record (1) the kind of medical treatment they want and do not want, (2) how they would like to be cared for, (3) information for their family and friends to know, and (4) how they would like to be remembered. Bone Marrow Donors Worldwide (BMDW) is the continuing effort to collect the HLA phenotypes of volunteer stem cell donors and cord blood units, and is responsible for the co-ordination of their worldwide distribution. Participants are 71 stem cell donor registries from 50 countries, and 48 cord blood banks from 32 countries. EURORDIS is a non-governmental patient-driven alliance of patient organisations representing 561 rare disease patient organizations in 51 countries. Be The Match® connects patients with their donor match for a life-saving marrow or umbilical cord blood transplant. A database that provides information in Spanish, English, German and other languages about more than 950 rare diseases and orphan drugs. The World Marrow Donor Association (WMDA) fosters international collaboration to facilitate the exchange of high quality haematopoietic stem cells for clinical transplantation worldwide and to promote the interests of donors. Serves patients diagnosed with leukemia and other fatal blood disorders from the South Asian community (people from India, Afghanistan, Bangladesh, East Africa, Guyana, Nepal, Pakistan, Sri Lanka, West Indies) and other minority groups who are in search of Blood Stem Cell /Marrow donors. The Aplastic Anemia & Myelodysplasia Association of Canada (AAMAC) is a leading funder of research into bone marrow failure diseases in Canada. 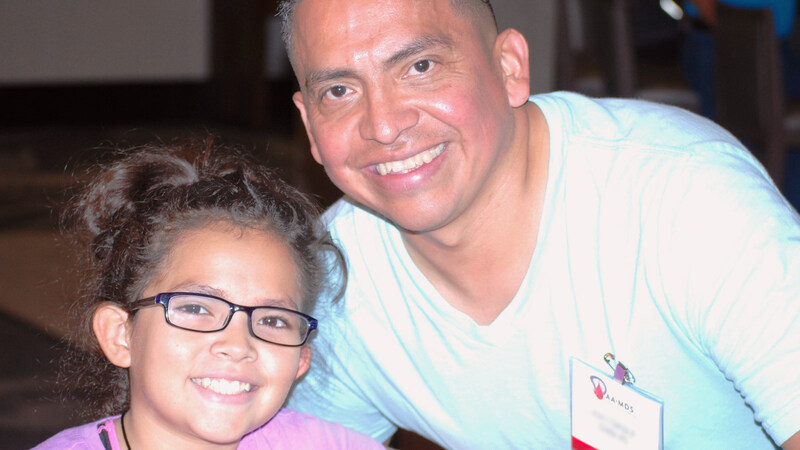 This volunteer-run organization supports patients and caregivers across the country who are living with aplastic anemia, myelodysplastic syndrome (MDS ) and paroxysmal nocturnal hemoglobinuria (PNH). Multi-disciplinary organization providing leadership and promoting excellence in patient care, research and education in the fields of blood and marrow transplantation (BMT). CORD is Canada's national network for organizations representing all those with rare disorders. Provide essential practical and emotional support for seriously ill children, young people and those who care for them across the UK to ensure they receive the best possible quality of care. Dedicated to supporting sufferers of aplastic anaemia and allied disorders. PNH patients in England, Wales and Northern Ireland who have formed a community in order to support each other and speak with one voice, providing relevant and reliable information. For more information, contact our Helpline at help@aamds.org or (800) 747-2820 x 2. Originally published on Tue, 03/01/2016 - 6:05pm. Last updated on Thu, 04/04/2019 - 1:00pm.